The tragic loss of their unborn child has devastated Kate and John, taking a toll on both their marriage and Kate’s fragile psyche as she is plagued by nightmares and haunted by demons from her past. Struggling to regain some semblance of normalcy in their lives, the couple decides to adopt another child. At the local orphanage, both John and Kate find themselves strangely drawn to a young girl named Esther. I finally got around to watching this, I’ve heard a little about it – mostly good things but have avoided checking any scores or reviews. After watching I checked it out and it seems to do well with a pretty solid 7.2 on IMDB. Personally I think it’s one of the better thrillers of this year, it’s not a horror movie so don’t be mistaken and it’s certainly no terror like Drag Me To Hell. Either way it’s a good film, Isabelle Fuhrman is phenomenal as Esther and the parents are well played by Vera Farmiga (who tends to get typecast to these roles) and Peter Sarsgaard (who has mainly been in B movies). It’s filmed well, tension is created by great use of music and SFX combined with interesting camera angles, close ups and shallow depth of field shots. The movie just gets more and more twisted as it goes along and I did guess the ending before it came, but it was still original and thoroughly enjoyed the movie. If you go into this expecting a horror, you’ll be disappointed – but if you watch this with an open mind as a thriller you’ll enjoy it greatly. I give a scissor in the eye 7/10. 8 Responses to Movie Review – Orphan – Thriller! This movie was incredibly good. The ending was really unexpected for my wife and I. We were thinking more along the lines of the supernatural and the ending was a shocker! It was very well done and is definitely worth watching. Huai Bin: Yah and there are adequate clues through-out to unravel the ending before it happens. Brad F.: Better than expected definitely, no doubt about that. KY: Yah can’t wait for that one! Drag Me To Hell?!! aiks, that was a comedy-horror for me. esp that scene with the bleeding (spraying?) nose, and the talking goat. 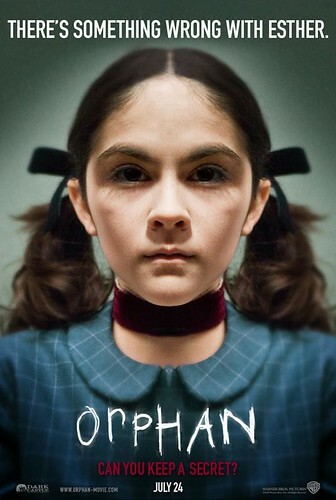 The Orphan on the other hand, is a solid movie, with a twist that I did not see coming. one of the better ones this year. Cute gal, she looks like she wants to get across a message. If someone is looking for a decent thriller this is a really good choice, but horror fans may be disappointed. As far as the ending goes, vigilant viewer who pays attention to details will be able to solve the riddle well before the end, nonetheless the idea itslef is still enjoyable. J2Kfm: The genre is terror la, it’s very kitsch and over the top. Fans of old Raimi films will understand. Orphan is a very solid film yes. Lisa: Well yah it’s not a horror so that’s to be expected and yes I did pick up the clues and solve the riddle before it was revealed.